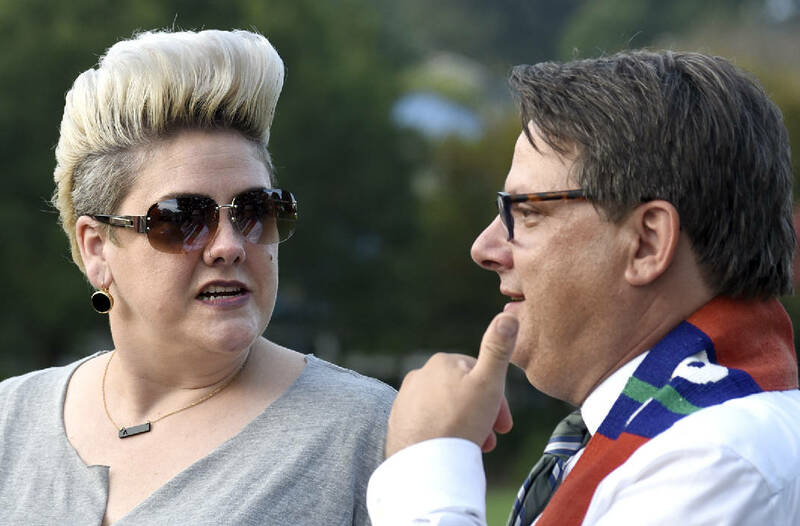 From left, Anna Golladay, who was in Charlottesville, Virginia, when the violence erupted speaks with Brian Merritt, pastor of Renaissance Presbyterian Church. The Chattanooga Democratic Socialists hosted a candlelight vigil for Heather Heyer and Charlottesville at Coolidge Park on August 13, 2017. Chattanoogans attended a candlelight vigil Sunday night in memory of the woman who was killed in Charlottesville, Va., after a car plowed into a group of counter-protesters. The vigil was hosted by the Chattanooga chapter of Democratic Socialists of America and featured speeches by several leaders of political and social justice organizations. The turnout was echoed across the nation as people gathered and marched to protest the Charlottesville violence, The Associated Press reported. They included Atlanta activists in town for a Netroot Nations event and Memphis residents who gathered at the statue of Nathan Bedford Forrest, a Confederate general, slave trader and Ku Klux Klan member. Activist Tami Sawyer said the violence in Virginia "isn't going to scare anyone from speaking up for equal justice." The Chattanooga group gathered around a stage in a corner of Coolidge Park by the Tennessee River. Several held signs with messages such as "Love is greater than hate" and chanted "No Trump! No KKK ! No fascist USA!" Many attendees chanted anti-fascist slogans, but others held signs and chanted against racism and white supremacy shown at Friday and Saturday's rallies in Charlottesville, which was in response to the city's plans to dismantle a statue of General Confederate Gen. Robert E. Lee. "We are here tonight to honor our fallen comrade," James Baker, of the Chattanooga DSA, opened his speech. 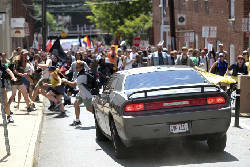 He was talking about Heather Heyer, 32, who was killed when a man drove a car in to a crowd of counter-demonstrators. Two Virginia state troopers also were killed when the helicopter they were using to provide aid crashed, the AP reported. "Let us be clear; Heather is a martyr to the causes of justice, equality and liberation," Baker said. "She is a hero in every sense of the word. We must remember her sacrifice and the sacrifice of those who came before her and draw strength from it, for we have much work to do." Baker continued, pausing for cheers from the crowd every so often. He warned that what happened in Charlottesville "will not be the last time that white supremacy and fascism show their face." Jared Story of Concerned Citizens for Justice said it's a shame that it's "taken creeping fascism" to get the city to a point where citizens will have a conversation about racism and white supremacy. "White supremacy is not just when violent people show up wearing swastikas," Story said. "White supremacy is when a city continues to pass a budget when 30 percent of that budget is for the police. It's when people in gentrifying neighborhoods call the police when someone who has lived in that neighborhood for 20, 30 years looks suspicious." To end the vigil, the crowd gathered close to the stage and sang songs of solidarity. Concerned Citizens for Justice member Aysja Pryor led a chant, an excerpt of Assata Shakur's "To My People." "It's always been like this, hasn't it," said Pryor, referring to the circumstances for which the crowd was gathered — after the death of an activist. A Chattanooga man was among three people arrested in Charlottesville amid the white supremacist rallies and counter-protests. A friend of Dunigan's spoke on his behalf Sunday to let the public know why he was there. 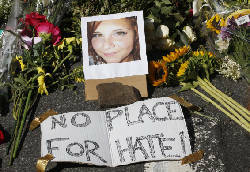 Beth Foster, co-director for Mercy Junction Justice and Peace Center in Chattanooga, said Dunigan wanted "to let everyone know he was in Charlottesville as part of an antifa action. He is an anarchist. He was here to confront white supremacy and antifa's practice is to use force if necessary in doing that." Foster said Dunigan is not officially part of the Mercy Junction Justice and Peace Center but "he is definitely a friend and ally of us." "Let the record show that the 'Chattanooga man' arrested in Charlottesville was part of the COUNTER PROTEST, and is NOT a white supremacist," posted Missy Foley, a woman who identified herself as Dunigan's cousin. "I'm not entirely sure what he did," Foster wrote in a text message. " Usually these kinds of things involve the person being attacked by a white supremacist and then defending themselves." Foster was among a group clergy members who went to Charlottesville to protest the white supremacist rallies. She said the group she was with formed a wall, arm in arm, against members of an armed militia. Videos surfaced on social media Saturday afternoon of those clergy members singing "This Little Light Of Mine" as armed men stood opposite them. She said the police were behind protective barriers, only helping with crowd control and not offering protection to counter-protesters or community members. "There were a couple of times yesterday that if antifa hadn't been there, I think I could have been hurt or killed," she said, adding that the group she was with had planned to block the entrance to a park. "The white supremacists charged us with shields and sticks and started hitting and pushing, and the police did not step over," she said. "If we didn't break the line and let them through, they would have hurt someone very badly." She said the second time they formed a line, the white supremacists did not reach them because antifa stopped them in the street. Foster said she has been to many protests but she has never experienced anything like the rallies in Charlottesville. "I've never seen the kind of evil that I saw yesterday," she said. "And I've never seen the kind of love and solidarity in the people confronting that evil." Contact staff writer Rosana Hughes at rhughes@timesfree press.com or 423-757-6327. Follow her on Twitter @HughesRosana.